Q&A after previewing the film at LA's Museum of Tolerance. 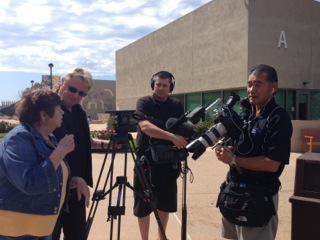 Museum Director Liebe Geft (l) interviews Cheryl Rattner Price (middle) and Joe Fab (r). 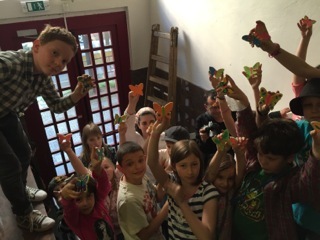 Students from the Lauder School in Prague hold up the butterflies they painted for The Butterfly Project. 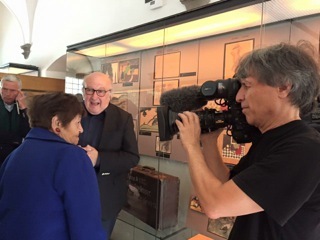 Filming Terezin survivor Ela Weissberger in Jewish Museum Prague in front of her art made as a child in the camp. Cast and crew taking a much-needed break from filming at Terezin Concentration Camp in the Czech Republic. 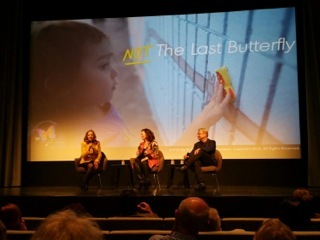 Included are Producer & Director Cheryl Rattner Price (middle), Produer & Director Joe Fab (right - yellow), and Survivor Ela Weissberger (far right - red). 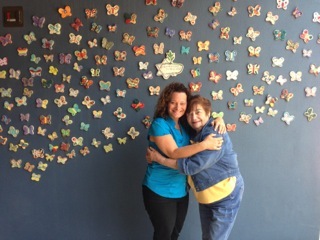 Cheryl Rattner Price and Ela Weissberger share a hug during filming in front of the Survivor Wall in San Diego. 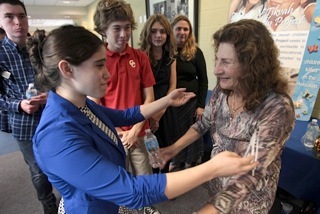 Producer & Co-Director Joe Fab gives Survivor Ela Weissberger directions before filming. 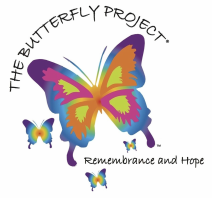 At a butterfly painting event, Survivor Adele Beim meets with the cast of The Diary of Anne Frank from North Coast Repertory Theatre in Del Mar, CA. 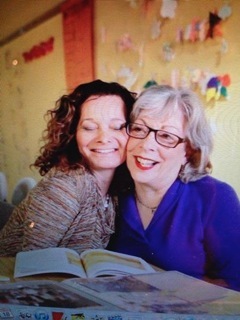 The Butterfly Project co-founders, Jan Landau (r) and Cheryl Rattner Price (l) enjoy a special moment during shooting. 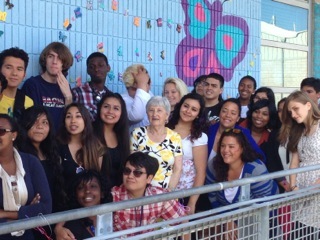 Survivor Rose Schindler gathers with students from San Diego's High Tech High as they unveil 1 of their 5 installations on campus.